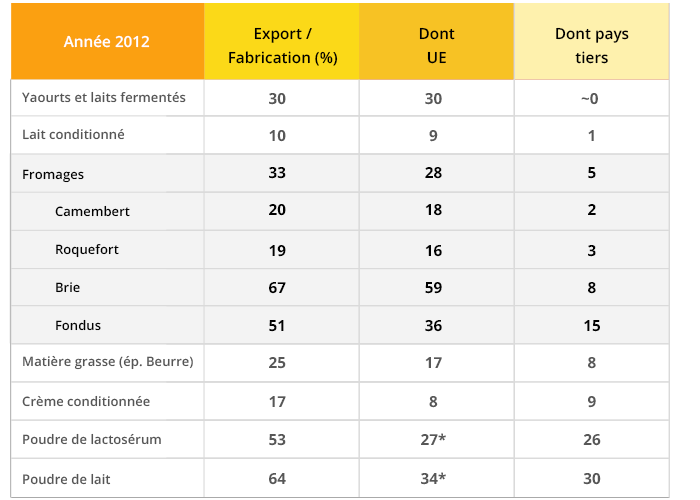 French dairy products are export champions! Four out of every 10 litres of milk are exported and the industry’s trade surplus reached €3.4 billion in 2016. This strong export business is supported by a favourable national and international context. France produces considerably more milk than it consumes. It is only natural then for the country to export it, particularly since the French dairy industry has many strengths that enable it to be competitive on international markets: its image, expertise, quality, and so on. An export-oriented industry in a favourable context! Who around the world has not heard of France, the country of 1,000 cheeses? The reputation that French dairy products enjoy abroad is the result of the industry’s ongoing investment in quality, food safety and communication. For dairy products, “Made in France” is a guarantee of quality, taste and sophistication. This excellent reputation results from ongoing efforts by the entire industry to guarantee quality at every step of the value chain, through good agricultural practices, milk controls and analyses, R&D, quality management, and so on. France sets an example in the face of food scandals, like the case of melamine in milk in China. As demonstrated in the production of raw-milk products, the French dairy industry has developed rigorous expertise in managing food safety risks and providing consumers with healthy, safe and good dairy products. The global dairy market is highly competitive, so the French industry must communicate to promote its products and develop new uses. This is exactly what it has been doing since 2007 through communication campaigns targeted at countries with a double-digit consumption growth: firstly, in rich countries such as the United States, Japan, and Korea, and secondly in those that have come to be known as the BRIC countries (Brazil, Russia, India and China). 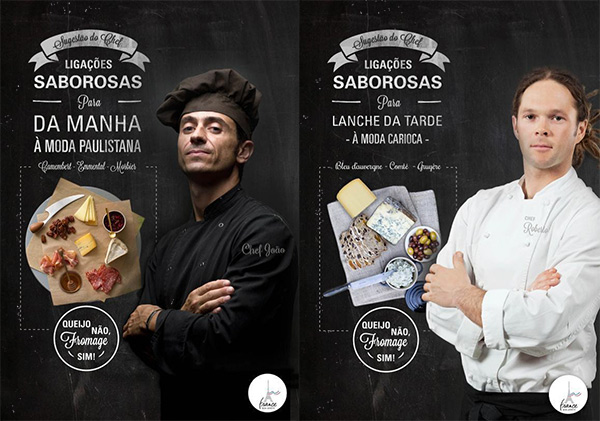 These campaigns build on the traditional messages of expertise, quality and so on, but also on the concept of making something one’s own. In Kyoto, Japan, 1000 people were able to take part in a tasting session which combined cheese and tea in a Zen temple. The most exported French dairy product is cheese, which represents 44% of all French dairy exports. Cheese is the perfect example of a value-added product as the dairy category that makes the most profit, propelling France to the rank of Europe’s third-largest cheese exporter in terms of value and first in exports of soft cheese and Emmental. 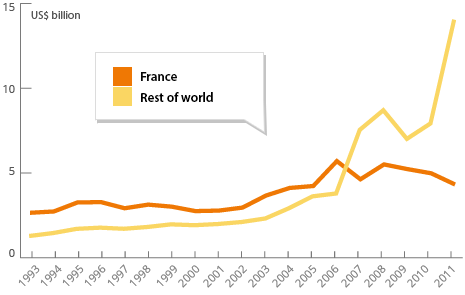 But France also exports to countries further afield where the reputation of French cheese precedes it; e.g. in Russia, China and Japan. Milk powder: a new white gold? The global market for milk powder is fast expanding. Some 56% of milk powder produced in France is exported, mainly to the European Union, Asia and the Middle East. 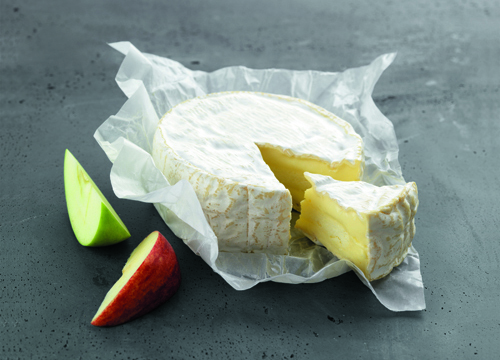 Camembert de Normandie (Normandy Camembert) an icon of French gastronomy, requires considerable expertise and a maturing period of at least 21 days – much longer than industrial cheese.. There are more than 1,500 varieties of dairy products, including 1,200 varieties of cheese! 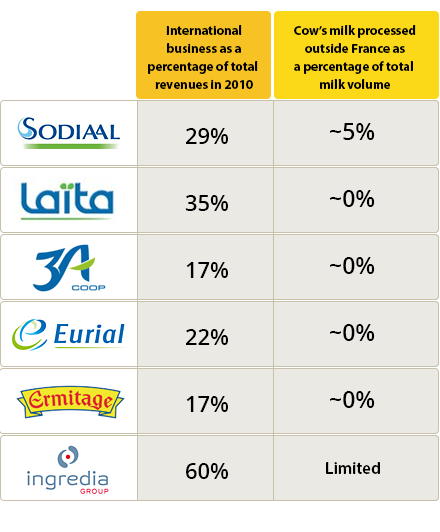 Five French dairy groups appear in the global top 25 dairy exporters! Firmly established on the five continents, they have longstanding experience in foreign markets and enable France to shine in terms of exports. 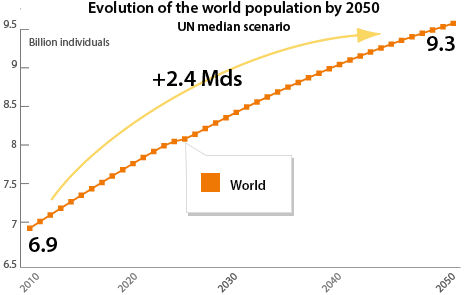 From 1990 to 2020 the global population will grow on average by 80 million people every year. Starting in 2020, demographers predict growth of 50 million inhabitants per year, bringing the global population to 9 billion by 2050! Africa and Asia largely have a shortage of dairy products. These countries also suffer from limited access to water and land, which are critical for dairy production. This is an opportunity for the French dairy industry. In 2050, emerging countries will account for two-thirds of dairy product consumption. This will represent 680 million tonnes, compared to 370 million in developed countries. France is well positioned on growth segments: industrial products and cheeses. 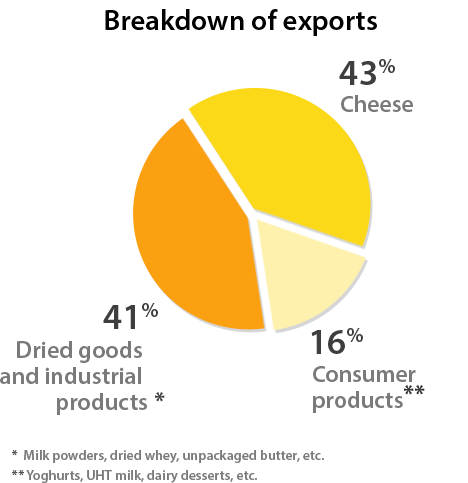 Cheese already represents 43% of French dairy exports, while industrial products such as milk powders represent 41%. From major groups to small and medium enterprises, companies adopt different strategies to expand their businesses internationally depending on their size, activity and markets. 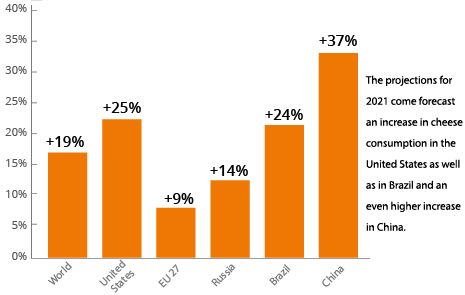 The global export market is a high-volume market for products such as milk powder. The European market is more focused on high value-added products, where the French dairy industry exports products such as cheese or milk-based desserts. Some companies, mostly cooperatives, approach international markets with an export and/or partnership strategy. They made products in France and expand their businesses abroad by developing distribution agreements with local partners to reinforce their position on their markets. Other companies maintain a major export business while expanding abroad through an international presence, in particular by acquiring local companies. In this way, they achieve a significant share of their revenues abroad. For example, Lactalis generates 70% of its revenues outside France. Companies export different product ranges within or outside the European Union depending on their existing partnerships and consumers’ habits and disposable income in each country, as well as product shelf-life, legislation, etc. 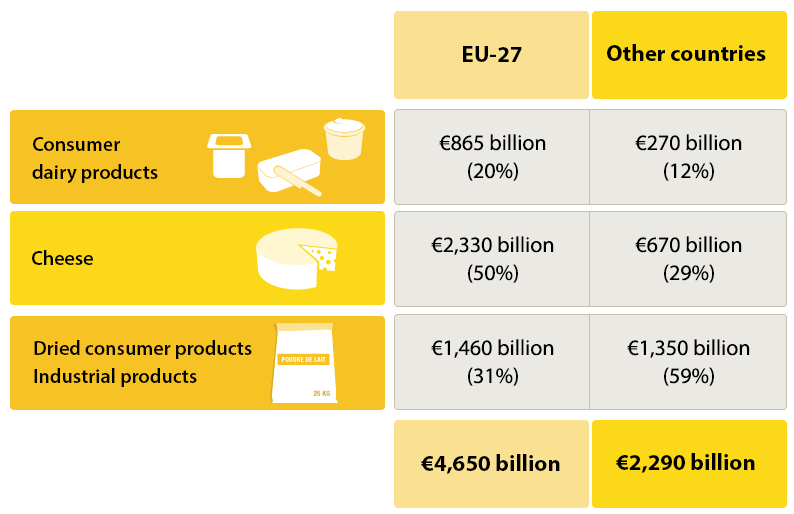 Companies therefore tend to export more cheese and fresh products (consumer dairy products) within the European Union, where it is easier to transport perishable products and where the standard of living is relatively high. Conversely, milk and lactoserum powders (dry products that are easy to transport), are exported to countries further afield, such as China. This country also offers interesting opportunities on the powdered baby milk market.